No one is going to promise an elk sighting, but it's just about guaranteed this time of year at Jewell Meadows in the Oregon Coast Range. 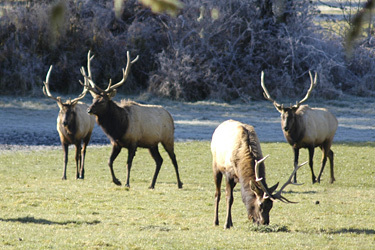 After the fall rut ends and hunting season begins, a herd of about 200 Roosevelt elk settles into the safety of Jewell Meadows. SEASIDE, Ore. -- Beach-goers may have gotten more than they bargained for Monday when a 12-foot-long thresher shark washed ashore in Seaside. ‘Simulacrums’ runs from September 24, 2009 through January 6, 2010. The Gallery @ Yummy wine bar & bistro is proud to premier ‘Simulacrums’ a collection of new works by John Payne. ‘Simulacrums,’ is a vibrant collection of new paintings by Portland Oregon artist John Payne presented at The Gallery @ Yummy wine bar & bistro and his first solo exhibition. At first glance the abstracted façades of the figures populating Payne’s creations are misleadingly simple and raw, yet as the viewer looks deeper into each piece the profound issues of personal identity and social commentary are unveiled to them. John confronts the harsh philosophical realities of the world, filtering them through his stylistic interpretations of wide-eyed figures and exaggerated proportions. Payne’s child like imagination, combined with a playful style of painting, take the viewer on an exploration through a darker, more complex and often melancholy universe enhanced by the viewers own interpretation of what they are seeing. Of the process of creating art Payne says it is “simple and emotional at the same time,” and something he thoroughly enjoys. Join us at Yummy wine bar & bistro for the opening reception of ‘Simulacrums’ on Thursday September 24, 2009 from 6-10pm to view the collection of new works by John Payne and meet the artist.